Tonight I wanted to do two things, write a post and eat a cookie. I like these coconut/walnut ones I get at Harris Teeter. They smell wonderful and taste quite good. When I went to the cabinet I remembered that I had picked up a new bourbon a couple of weeks back and I really enjoyed it. I typically drink scotch whisky but every now and then I need a little bourbon. Typically I go for Woodford’s Reserve, it never fails! So how did I end up with this one? I was actually picking up some scotch for Christmas time, like I needed an excuse, and happened to spy this shapely little bottle of Russell’s Reserve parked next to the Woodford on the top shelf. I’ll admit it, I’m a fool for good packaging and graphic design, and this one hit me just right. I think it cost around $30 USD so going with the principle that the price often dictates quality, I bought it. So this product is out of the good folks who produce Wild Turkey bourbon in Lawrenceburg, KY where James Russell is the Master Distiller there. This product is a special offering from them that they have had since early 2000’s but it has seen some variation in packaging over the past decade. I’d like to say they nailed it on this one! It is 90 proof or 45%ABV and is classified as a “Kentucky Straight Bourbon Whiskey.” I poured it neat, per usual and dove in. The color of it is beautiful and rich. The nose is very candied with vanilla and caramel coming forth and this is why I pulled it out tonight with this cookie! The first time I tasted this (prior to tonight) I was really impressed with the flavor, mouth-feel and finish. It is wonderfully refined and what you smell is what delivers on the palate. 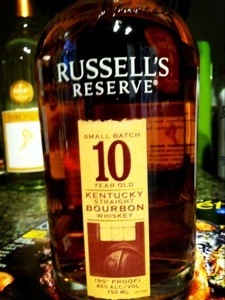 I don’t drink a lot of bourbon but if I did I’d be running through this stuff with no abandon! The finish is refined, gentle, and stays with you. I have to admit, this is a damn fine whiskey! And it goes really well with cookies!